Alison Edmunds, now 35 years old, works as the exhibit manager at Melbourne Aquarium in Melbourne, Victoria, Australia. Aquarists from the aquarium occasionally catch wild sharks outside the aquarium and bring them in for public display in the aquarium’s large tank, or oceanarium. Here the sharks may also be used in groundbreaking shark reproduction research. 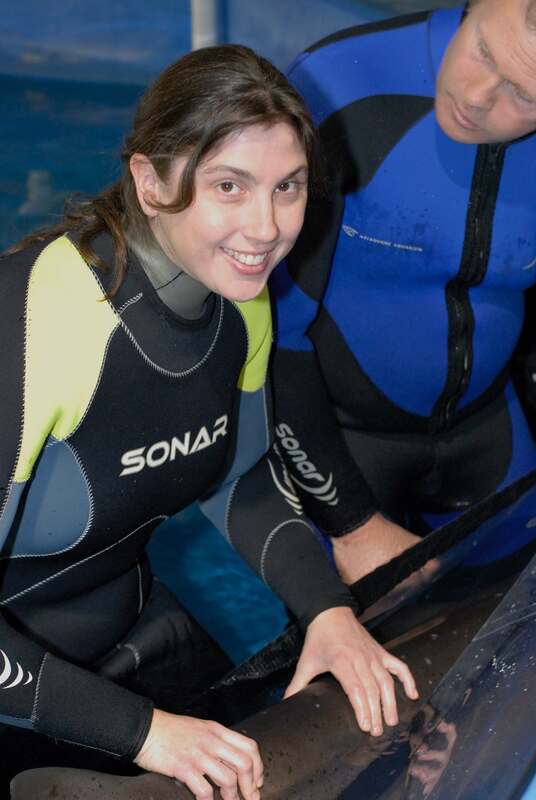 In 2006, Ali was working as the assistant curator at the aquarium. 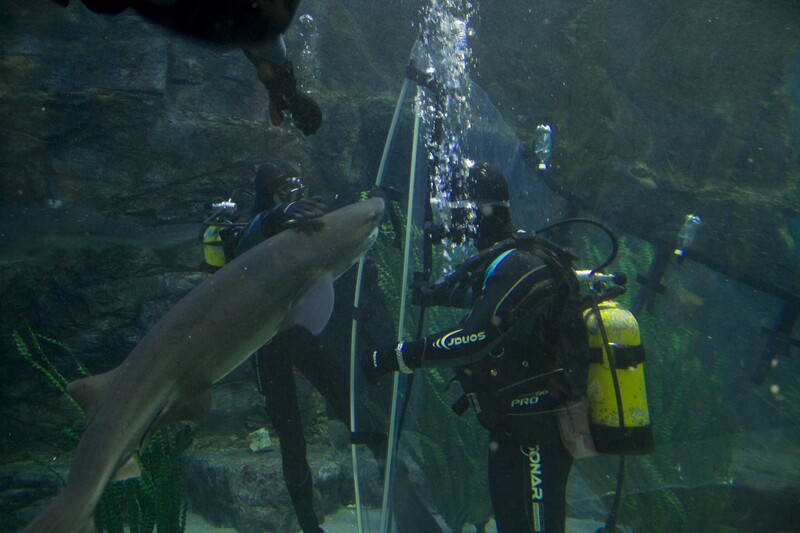 Once a week, a small team of aquarist divers would lead one of the aquarium’s six broadnose sevengill sharks out of the oceanarium through a gate to a shallower, smaller pool called a lock. There, the researcher would perform an ultrasound and possible artificial insemination, then take the shark back to the oceanarium. One day, however, something went wrong, and Ali undertook a never-before-attempted treatment to make things right again. Alison Edmunds performs a massage treatment on Bella, a broadnose sevengill shark, at Melbourne Aquarium. Photo courtesy of Alison Edmunds. Bella was one of the animals we were using for the reproduction research. She was around 15 years old at the time, just under 100 kilos and 2.6 meters long (220 pounds and 8.5 feet). One day when we brought her through the gate, she turned sharply and overstretched one side of her body. Later, we noticed that she didn’t recover in her normal fashion after the procedure — she seemed more lethargic. We monitored her closely, and over the next few weeks her feeding drives started to lessen, and we noticed she was starting to swim almost with a swimming limp, a slight curve to the right-hand side, and very rapidly her muscles started to atrophy along that side. When you overstretch a muscle, it responds by shortening, and the blood supply decreases to that muscle. Within weeks, she was swimming in a very tight circle and bumping into walls. She didn’t want to eat and was starting to damage herself. As her health deteriorated, it was obvious she was not going to be able to heal on her own. The rest of the team had a big laugh, but he said, “You know, Ali, that’s probably not such a bad idea.” Working as a dog and cat vet, he’d had some cases in which traditional medicine wasn’t helping, so he’d send clients for an animal massage — though as far as we know, massage had never been tried on sharks before. Dr. Jones contacted Dr. Alex Hauler, a vet specializing in canine sports medicine, who frequently performed massage on pets and racing greyhounds. Alex was a king fisherman who was usually on the end of a hook and line with a shark, and wasn’t used to being in the water with them. I’d known Bella for five years, so I was quite familiar with her. It’s like working with dogs: You know that if you do the wrong thing by them, they could turn around and bite you, but if you’re skilled and comfortable and know what you’re doing, then you’re pretty safe and the shark is pretty safe. Alex and I worked together on Bella, looking at the way she swam and the muscles she was no longer using as they atrophied. During the first massage, we got into scuba gear and led Bella out through the gates from the oceanarium where she was on display into the much smaller locks pool, which is only 4 feet deep. When we move a shark into the locks, we have the shark swim into a big, clear sock bag, then we swim the bag up to the doorway of the lock and bring the shark out of the bag. We run a hose from the tank to the mouth of the shark, and add bubbling oxygen to it. This keeps the animal happy and stress-free because he or she doesn’t need to keep moving to get that oxygen. We held Bella, but when you’re working with a 100-plus-kilo animal, you’re not really holding the animal in place; she could’ve swum away if she wanted to. 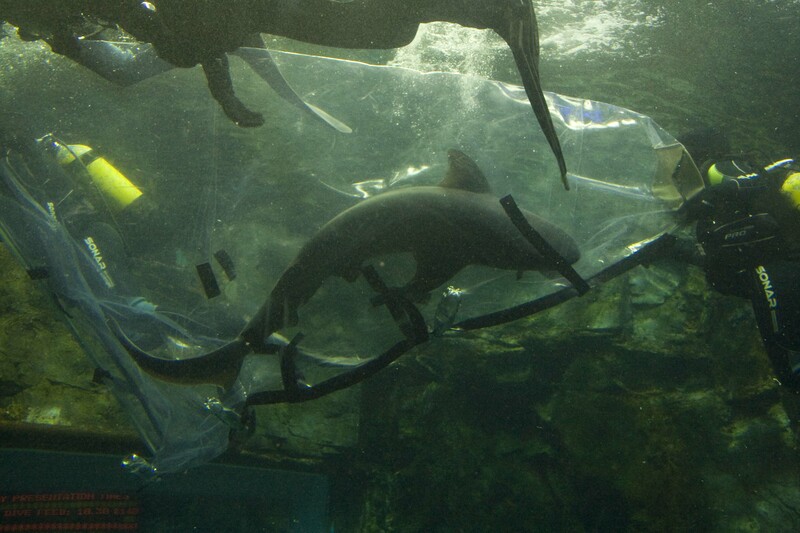 Aquarists lead a shark into a sock bag to transport it from the main oceanarium into the smaller lock area. Photo courtesy of Alison Edmunds. Once in the sock bag, aquarists will swim the shark to the lock area for ultrasound or, in Bella's case, massage treatment. Photo courtesy of Alison Edmunds. Sharks’ skin is like sandpaper; they have what are called denticle scales all over them, which are like tiny, sharp teeth — part of why they can cut through the water so easily. If you run your hand down the length of a shark from head to tail, the skin is smooth, but if you run from tail to head, the skin is very rough and can tear the skin from your fingers. Underneath the skin, though, the tissue on a shark feels very similar to that of a human or any other animal. On a human, you generally use a lot of long, sweeping motions, but shark massage is more similar to shiatsu massage, where you’re pressing along the muscle rather than stroking it. We located her pectoral girdle — the equivalent of our shoulder girdle — and ran along the muscles to feel for areas where the tissue felt too soft or too hard. When we found one, Alex would pop a needle in and out where he thought there was a trigger point. The needle turns off the pain pathway from the nerve to the brain; when the nerve tells the brain there’s a muscle injury, the brain responds by keeping the muscle shortened to prevent further injury. When you’re able to turn off that pathway, you’re better able to stretch the muscle back out. One by one, we found Bella’s trigger points and switched them off, then worked on lengthening the muscle. Using our thumbs, we would stretch along the muscle to lengthen the fibers, then hold the stretch for a moment until we felt the fibers slowly release. During that first session, Alex did most of the treatment, and I mostly watched and learned. That session, we stayed around her pectoral girdle for the full 10 minutes, which is as long as we keep the sharks in the lock. When we released her back into the tank, we jumped out of the water and ran down to the viewing area to look at her reaction. She started to make an attempt to turn to the left! We all exclaimed excitedly, because it had been a week since she’d turned that direction. It was great. We knew the treatment was successful because she was attempting to turn, but we needed to do more. We gave her two weeks between each treatment to give her time to respond to the treatment. During the next treatment, we worked from her pectoral girdle to her pelvic girdle, where her pelvic fin attaches to the underside of her body. We did five or six treatments over a number of months, and with each treatment, she would swim further out of this tight circle and around the tank. Previously, we’d had to take food to her because she couldn’t reach the part of the tank where she was fed, but within three treatments she could get to her feed area again. Her muscles started to recover from atrophy and redeveloped by 90 percent. She still favored her left side, but after the last treatment, she was swimming throughout the entire oceanarium and having no problem navigating. It was exciting to be helping Bella, and very satisfying to see her swim better with each treatment. When an animal has an injury, people are often so quick to want to give anti-inflammatories or even do euthanasia. This was amazing — as far as we knew, no one else in the world had done this type of treatment before, and in this case massage truly saved Bella’s life. I don’t know of any other situation in which massage has been life-saving. Two years after Bella recovered from her life-threatening injury, we released her back into the ocean near Melbourne Aquarium where we found her. We’ve since performed massage treatment on a total of five sharks, and in all cases, it’s helped immensely. In one case, it took only a few minutes for the shark to fully recover. How wonderful it is to work in a team of people willing to try a method not considered mainstream — and on a shark, of all creatures. Sharks don’t have the same emotional responses as dogs or humans or other mammals, but the proof that this was the correct treatment was the fact that Bella responded immediately. Had we not seen her swim better straight after the massage, I’m sure we still would have given it a second treatment, but Bella told us, in no uncertain terms, that this indeed was the treatment she needed. And we got it right. The pioneering treatment of shark massage saved Bella's life. 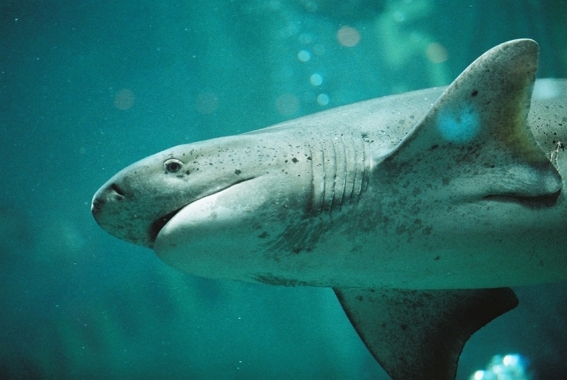 The broadnose sevengill shark has since been released back into the wild outside Melbourne Aquarium. Photo courtesy of Alison Edmunds. And Bella looks so happy in the last picture! Absolutely amazing story! Thanks… C U later 4 turkey….. Thanks, Troy! Great to see you. Never underestimate the power of Massage.